Sissy ordered caramel french toast for her annual birthday breakfast in bed. Piper had to eat cold cereal on the floor of Sissy’s bedroom. Piper opted out of the french toast when she saw me making “stuff you dip in eggs that’s gross.” She did dig two chocolates from her own Easter basket to add to Sissy’s vitamins. She’s got a generous heart, that one. Piper was pleased just to step into the sacred preteen space. We, too, were allowed into Sissy’s bedroom to deliver the breakfast and wish her a happy birthday. It was quite a treat. “What’s the best gift you ever received?” I asked Sissy, stopping myself short of cutting the french toast. Back off, Mom. Got it. Sissy thought for a minute. “Probably my bike,” she said. “I think Piper’s the best gift we ever gave you,” Dad said. Sissy and Piper exchanged incredulous glances. Me? Her? 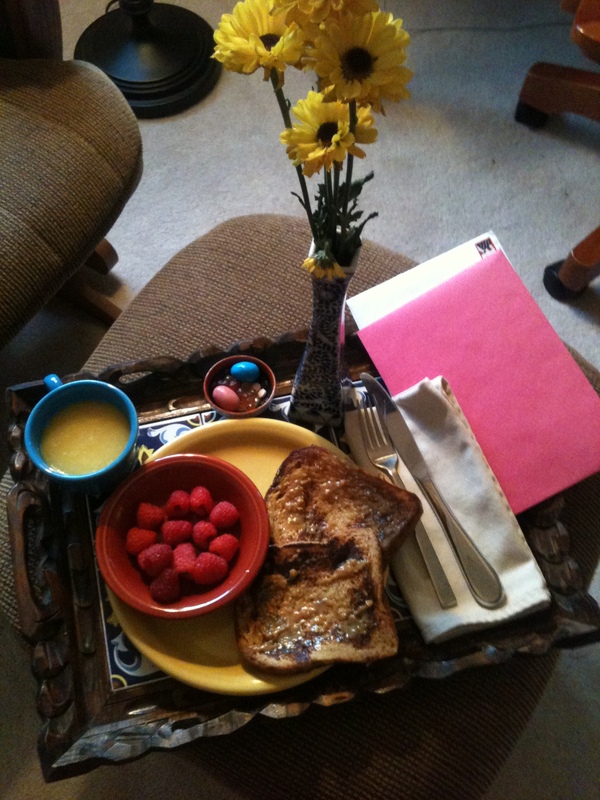 This entry was posted in Daily Dharma and tagged as is, birthdays, breakfast in bed, caramel french toast, no returns, siblings by melissa.scholes.young. Bookmark the permalink. Happy Birthday Sissy! And Piper, no one’s returning you!! Thanks for the birthday love! So good to see you. I’ve ordered my copy of the book. Congrats! Happy Birthday Sissy — my sister and I grew up to be best friends! Thanks for the birthday wishes! I can only hope the same for Sissy and Piper.